With authorisation for Quora through Twitter, suddenly lots of the people I follow there are starting to follow me on Quora (and vice versa). Surely that’s got to be some of the dynamic over the last few days. It’s coming from the ‘Follow People You May Know on Quora’ section on the right hand side and it’s just one follow after another. There’s now even a ‘Follow All’ – which for me will make me follow 36 people in one go. That’s a huge amount of follow spam. I thought that there must be a way to deal with this without setting up a filter in my email. There is. 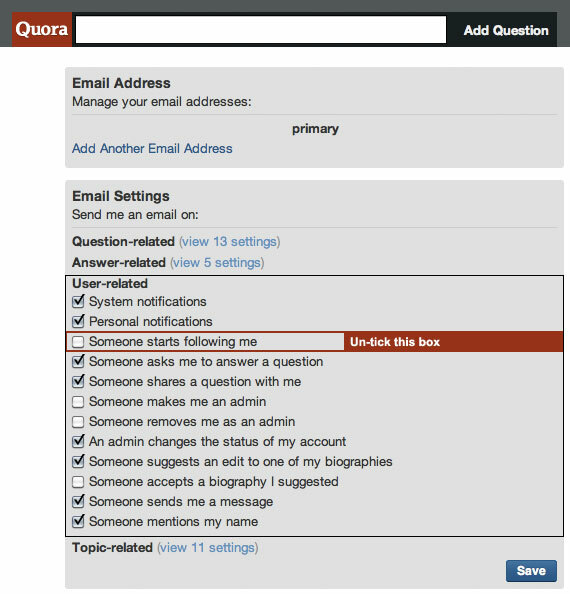 You CAN change the Quora settings so that your inbox isn’t inundated with Follow request. Don’t forget to check back occasionally to see who else you can follow, but at least it sets you free from the Quora avalanche of follows – unless you like to feel important.